Welcome back, dear readers to my second part of reviewing Bleach Season 1. When we left off, I was discussing Urahara and his mod soul Kon. I will pick up from there, if you don’t mind. In the next episode, we get a glimpse into Kurosaki Ichigo’s past. His mother was killed when he was a young boy by a Hollow. When he was a boy, he did not realize it was a Hollow. He was only able to see ghosts; he did not know Hollows existed until he met Kuchiki Rukia. He had been walking home with his mother when the Hollow came and took her away. Ichigo had to watch this happen in front of him. In this episode, it is the anniversary of her unfortunate death, and we see the human side of Ichigo and his family, including his father. It is the one day a year where his father acts somewhat normal to him, and smokes his only cigarette for the year. You can tell that Ichigo’s father – Isshin – was very much in love with his wife. As they are visiting the grave, they are confronted by the same Hollow that attacked his mother. The Hollow is called the ‘Grand Fisher’ and he tricks people with his lure, hence the Fisher title. Ichigo is able to attack him and cause him immense damage, but is unable to kill him. He disappears and makes his way back to where Hollows reside – a place called Hueco Mundo. We’ll be seeing much more of this plane later on in the series, but for now – it is where Hollows live. Next, we are reintroduced to Ishida Uryuu, the last Quincy. We learn that Quincies are the sworn enemy of shinigami’s, and will do anything they can to destroy them. Ishida releases a potion that will draw Hollows to the area, so they can have a competition to see who can hurt the most Hollows. Karakura Town becomes overwhelmed with Hollows, making it so neither of them are able to contain them. We find out that Chad can see Hollows now, in order to help protect Ichigo’s sister Karin, and fights back. As he does this, he develops a new power – his right arm is transformed and is able to shoot energy at the Hollows to destroy them. So, now we’ve got two of Ichigo’s friends (or enemies) that have powers to help his fight as well. Following this episode, we find out that Rukia has broken Soul Society’s law by giving her powers to Ichigo. A shinigami by the name of Abarai Renji appears to take Rukia. Ichigo is enraged and challenges him to a battle. They are well-matched until Renji releases his zanpakuto’s (sword) first form, and Ichigo realizes that he is no match for him. He finally finds his footing and becomes more confident, but then a new shinigami comes to collect Rukia. In the process, this new shinigami – Kuchiki Byakuya – severely injures Ichigo, so Ichigo cannot follow. Rukia says she’ll return to Soul Society only if Ichigo’s life is saved. Ichigo has been stripped of his powers. Just as Rukia returns to Soul Society through a sliding gate, the shopkeeper Urahara appears. He says he will help Ichigo train to save Rukia. Rukia had begun to go to school with Ichigo but when he returned to school the following day, no one except for Chad, Inoue and Ishida remembered her. This was thanks to a memory wipe done by Soul Society to make everyone forget who she was. Ichigo begins to train underneath Urahara’s shop in what amounts to a giant canyon. One would never suspect something this large underneath such a tiny shop. Urahara is full of secrets. Urahara pops Ichigo with his cane, which makes Ichigo’s soul leave his body. However, unlike when this occurred while he was a substitute shinigami, he is a normal soul now, who must regain his shinigami powers. We see Ichigo go through a lesson in his normal soul body. After he completes this lesson, he then has his chain broken (the chain that has been keeping his soul anchored to his human body) and it begins to eat its own links. Urahara drops him into a very large hole that his assistant dug (a very cute girl by the name of Ururu). We watch as the chain begins to disappear and then finally, Ichigo is left with a Hollow hole. In the next part, we see that Ichigo is in a city, sitting on a skyscraper window, sideways. Above him is an older man who has long hair, a long billowing cloak and glasses. He tells Ichigo that he has always had shinigami powers – Byakuya only took the ones that he (Ichigo) had been borrowing from Rukia. He tells him that he needs to find the 1 box, out of the thousands that are falling from the sky, that contains his shinigami powers. He finds it, but it is too late. The Hollowfication process has begun. He shoots out of the hole and stands there with a Hollow mask, dressed as a shinigami. Ichigo then removes the mask and fights Urahara again. He attempts to draw his sword, but it is broken – it is not his true sword. The older man appears again and reveals his name to Ichigo – Zangetsu – Ichigo’s zanpakuto. Then, the real fight begins. Urahara has his own zanpakuto – which means he is/was a shinigami – but more on that at another time. For now, he uses his zanpakuto to protect himself from Ichigo’s power – he throws up a shield and still Ichigo blasts through it, and leaves a deep crevice in the ground behind where Urahara is standing. Ichigo is powerful – extremely powerful. While Ichigo is training with Urahara, we see Orihime, Chad and Ishida begin training with their powers. A cat by the name of Yourichi trains them. And yes, the cat speaks. Orihimie is so trusting and childlike, it doesn’t even phase her. However, the men? They have minor freak-outs at the situation. So, Yourichi begins training Orihimie in using her powers (the two hairclips that she wears house 6 fairies that help her), as well as Chad with his powerful arm. Ishida trains alone in the way of the Quincy. They all decide to go to Soul Society with Ichigo. We get a glimpse of Soul Society, only briefly, in the last couple of episodes of this season. We learn that Rukia is to be executed in 25 days for her betrayal of the shinigami. We also meet two other captains of Soul Society – Gin Ichimaru and Kenpachi. These two men, with Renji and Byakuya, will be pivotal agents in the next season. At the end of the season, Urahara tells Ichigo to leave his bedroom window open at a specific time in order to receive a message. He receives the message and starts to leave, only to have his father stop him. His father gives him an amulet, saying that his mother gave it to him to protect Ichigo. Ichigo takes and it goes to Urahara’s shop, where he finds his friends there waiting, as well as Yourichi. And yes, Ichigo freaks out that the cat can speak. Urahara then opens a Senkaimon – a gateway that connects Earth to Soul Society. Then, Ichigo – Ishida – Chad – Orihime and Yourichi step through the portal, making their way to Soul Society. And that’s where this season concludes. There is a lot of information that you receive throughout the last few episodes of this season. Bleach tends to do that. Information comes to you in droves. I think that’s one of the things I enjoy about this series. The information just doesn’t stop. And that’s what makes it great storytelling. Stay tuned for my next review of Season 2. Until next time! You ready to jump into some anime with me? Yeah? Good, let’s do this. The first season of ‘Bleach’ is an attention getter from the get-go. For all intents and purposes, I will be referring to the characters as to how they are referred to in the Japanese version. I have only watched the Japanese version, so please forgive me if you watch the English version. 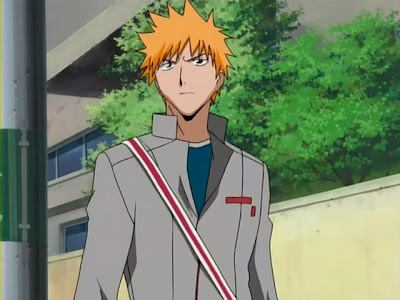 In the first episode, we meet Kurosaki Ichigo and are introduced to his family. Kurosaki is a unique individual. He can see spirits that are lingering on Earth, the ones that don’t seem to want to move on to the next plane. He approaches an alleyway where a girl had been killed and keeps her spirit company. As he is keeping the spirit company, he witnesses a woman in black garb battling a monster of sorts. This monster goes after the little girl, and Ichigo does his best to protect her. After tending to the spirit, he heads back to his house where his deranged father attacks him, playfully – of course. His father owns a medical clinic, and their house is attached to it. He has two fraternal twin sisters – Karin and Yuzu. Later the same day, the woman in black makes an appearance in his room, asking him if he can see her. He tells her yes, and she then comes to find out he can see Hollows (the monster that had been in the alley) as well as spirits. She explains that she is a Shinigami – Soul Reaper – from Soul Society. Soul Society is where souls go after they pass away. She explains that the being they saw was called a Hollow – who was also a soul, but due to their inability to get to Soul Society in a timely manner become a monster. Then, the Hollow they had battled earlier in the day shows up outside of Ichigo’s house and grabs Karin from inside. Ichigo goes and rushes outside, trying to save his sister. The Shinigami – Kuchiki Rukia – becomes severely injured and then looks to Ichigo, telling him in order to save his sister, he must take her power as a Shinigami to defeat the Hollow. He looks at her and nods his head, and throws himself on her sword (her zanpakutou), becoming a spirit himself – now dressed in the same black garb that Rukia had been wearing. He takes care of the Hollow, and seals his fate as a Substitute Shinigami. This all happens in 22 minutes. A lot of information is thrown at you out of the gate. I mean, in 22 minutes, we see the “bad guys” and then learn about souls and a place called Soul Society. To see no hesitation occur in Ichigo is one of his strongest characteristics that carries throughout the show. He wants to protect everyone – no matter what the cost. We will see this happen again and again throughout the 15 seasons. In the next few episodes, we’re introduced to Ichigo’s friends from high school – Orhime Inoue, Yasutora “Chad” Sado, and Uryuu Ishida. Each of these characters have special abilities, like Ichigo. Some we won’t learn about until the following season, but they are all very unique. Uryuu Ishida is the last Quincy in existence. A Quincy is someone who wants to rid all Hollows from existence. Quincys and Shinigamis do not get along – according to Ishida. Ishida, when we learn of his power, attempts to go after Ichigo. One of my absolute favorite episodes of this season is with Sado. He finds a cockatiel that can talk, and he helps take care of it. It turns out that the cockatiel is actually a soul of a boy who had been killed. It is said that this cockatiel is cursed, but he is only this way because Hollows continue to chase after his soul. With the help of Rukia, they are able to defeat the Hollows and send the child back to Soul Society. When Ichigo becomes the Substitute Shinigami, he must find something to do with his body – a shinigami fights in their “soul” form. Rukia goes to a shop which is run by a man named Urahara. He is a very eccentric man who wears flip-flops and a green and white stripped hat, and uses a fan a lot. 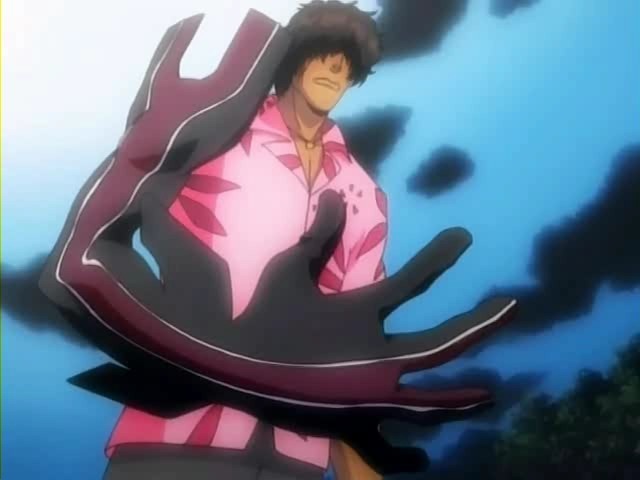 We don’t learn much about this man in this season, except that he carries items that Shinigami need. He sells Rukia some “Soul Candy”, which Ichigo is to pop into his mouth to become a Shinigami. Well, the candy turns out to be a “modified soul” – the candy was actually an artificial warrior that was created to help Soul Society get rid of Hollows. This modified soul, when not in Ichigo’s body, is stuck inside of a lion stuffed animal. The modified soul’s name is Kon. Like the true nerd that I am, a friend of mine went to Anime Expo right before my birthday and bought me a Kon backpack. I love that guy. So, some friends of mine told me that I needed to start watching ‘Bleach’. Now, I’ve never watched an anime show. I had seen ‘Ninja Scroll’ and ‘Final Fantasy VII:Advent Children’. These are the only two things I had seen that are considered anime. But to me, ‘FF VII’ doesn’t count towards anime – I look at that as a sequel to the video game. But I digress. A few months ago, I decided to take the plunge. And 253 episodes in, I’m in love. ‘Bleach’ is about as awesome as they come. I don’t really look at it as anime. I mean, I know that it is because it’s animated and it comes from Japan, but to me it’s just an engrossing show. I care for all of the characters very deeply. It’s like I found something to replace the void that ‘LOST’ gave me when it finished in May. And that’s about the time when I began my journey into Kurosaki Ichigo’s life. I began the show by watching it in its true form – Japanese actors with English subtitles. I know that they show ‘Bleach’ during ‘Anime Night’ on Cartoon Network, but I began my adventure at the beginning of the week, and ‘Anime Night’ occurs Saturdays at midnight. I wanted to start at the beginning, and I knew if I watched it on Cartoon Network, then I would not be able to do that. I’m sure I could have found it online somewhere, but it felt necessary to watch it in Japanese. Boy, am I glad that I did. The one time I attempted to watch the English dub, I lasted about 10 seconds before I lost it. To me, Ichigo’s Japanese voice is the epitome of sexiness. His English counterpart? A laughing stock. But, this is just my opinion folks. Over the next few weeks, I’ll be taking you down a journey through each of the seasons. There are currently 14 seasons. I’ve made it through 13. Roughly each season is about 20+ episodes. There are some that are much longer than that, and there are some seasons that are much shorter. I hope you enjoy the journey as much as I have.